With our built-in 600mah battery, do not waste money to buy more AA batteries. Our mouse can work up till 10-15 days with a long life time while full charged. Charging with your PC or Power bank via USB cable, can be used while charging as a wired Mouse. If mouse stays out of work for 8 minutes, it will turn to power saving mode, press left button to restart it. Humanization design: Mute button setting will make a more quiet working life for you. Comfortable and great hand-feeling, can be used for a long time without fatigue. In order to ensure the safety of transportation, all our mouse does not have enough power before shipment, the original power only support to try for customers. Charging your mouse firstly while receive it! Ergonomic design: Good surface coating technology given you a skin-like touch feeling.User-friendly design provide all-day comfort for work and entertainment, portable and pocket-sized perfect for travel , Mute design keeps away annoying clicks.Bluetooth function eliminates the risk of leaving your mouse nonfunctional due to losing the separate USB receiver of normal wireless mice. 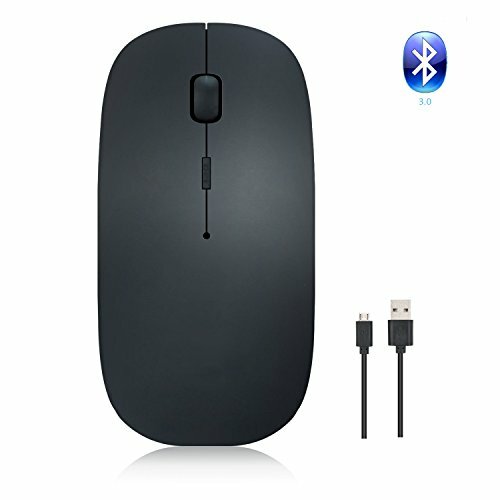 Easy Connection:The Bluetooth mouse connect your devices in 3 seconds and with no any drop. No USB receiver is needed if your devices come with integrated Bluetooth hardware. [A Bluetooth dongle is needed If your devices don't come with integrated Bluetooth hardware. (Bluetooth dongle is not included in this item. ]When the battery is out of power, you can also use usb cable to connect with your computer. Power-saving:Built-in 600mAh lithium battery 10-15 days to enjoy without interruption with built-in-battery while is full charged. (120hrs continuous working in test )Fast charging by micro usb cable,you needn't to buy batteries for your mouse anymore.You can charge the mouse with your PC or Power Bank conveniently.The mouse save power intelligently in 10 minutes of inactive, it will turn to power -saving mode, don't be surprise, click on the left button,the mouse will awake. 100% Customer Satisfaction:30 days money-back and 12-months guaranty, when you are not satisfied with our product or have any question, please contact us,we will give you a satisfied response within 12 hours. If you have any questions about this product by BOOMER VIVI, contact us by completing and submitting the form below. If you are looking for a specif part number, please include it with your message.